I am LOVING this little table!! I found an old antique sewing machine base at a garage sale this weekend and knew immediately it needed to become a table of some sort! I already had what I think to be an old hospital bed headboard in the garage and it fit the top of this base perfectly! ﻿The base is a White brand and I decided to leave it as is instead of painting it because it has that old rusty feel that I love. I painted the headboard top white but then added a dark glaze so now its kind of a cream or tan color with all the streaky goodness that the glaze leaves. It is on my front porch in this pic with a plant and an old pitcher but it could be so cute as a nightstand or end table by a couch. There are so many possibilities!!! It is 33" wide and 16" deep. Ok let me just start by saying the pictures do not do this piece justice! I could not for the life of me get the true color to show up! It looks very white or off white with a hint of gray in these pics, but its got a lot more depth to it in person. The color is actually called Sea Salt by Sherwin Williams (which just also happens to be the color of the walls in my living room), but I also glazed over it so the color changed a bit. There are hints of green and blue depending on the light, but the color remains extremely neutral. And with the glaze, it also gives it very subtle brown highlights. I know that all sounds weird and pretty ugly, but trust me....It is G-O-R-G-E-O-U-S! I did some research and this was actually made in the 1940s by a company called The Cavalier Corporation out of Chatanooga TN. These were considered very fine quality and very desirable back then and has definitely stood the test of time! It is still in almost new condition! 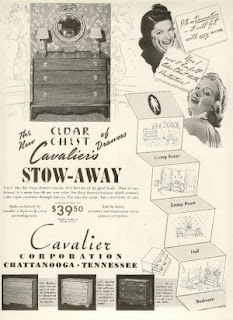 The marking inside says "Complete Cedar Chest Protection, Aroma-flow Constructed Drawers". There is also a mechanism that locks all 3 drawers with one key. Unfortunately this chest did not have the key included, so it won't work as intended unless you were to have it re-keyed. I have no idea if that's even possible. The dimensions are 3 feet wide by 19 inches deep by 30 inches tall. Before, the details didn't really stand out. But now, you notice the beautiful leaves and flowers, curvy lines, and carvings! We painted it white, glazed it, and repainted the top to be a solid glossy mahogany brown. We even sprayed the hardware with a copper and then an oil rubbed bronze color to give it multiple layers of color. It really looks like its been that color forever! Beth also has a matching dining table, chairs, and hutch that will eventually get the same treatment. It may be a while before I get to see her again, but I will never forget how much fun we had working on this project together! Love ya Beth!!! In honor of Mother's Day, I wanted to send a huge shout out to my mom Peggy! If you have wondered where I get my love of painting and crafting, just look at these pics of some of her work! She is awesome and has taught me so much. I am so grateful that she passed down the "handy" gene! She actually not only paints and refinishes furniture, but she can BUILD stuff! I have only done one or two projects like that and I guarantee she was right there to help me. I haven't learned how to quite tackle building projects like that yet, but knowing my mom, she will be teaching me that trade one day:). The pic to the left is her hutch. Isn't it gorgeous!!!! I wish I would have taken a closer detail pic because it turned out AMAZING! Here are some more of the things she has made or painted for her own home. She is also available for custom work so let me know if you would like her to do something for you. I LOVE YOU MOM!!!!! and headboard for her room! This is her patio table that she mosaic tiled. This beautiful blue side table sits in her bedroom. all a very deep rustic feel. This sweet little burlap pin board is made from a vintage wooden frame painted red and distressed. It is so veratile and could be used not only to display jewelry, but pictures, recipes, or favorite scriptures! I have also included 2 wooden push pins. It measures 7 1/2" by 9 1/2" (not including frame). Pair this with a cute easle and set anywhere in your house! So cute! I have several other frames on hand, so if you would like one made in another color please feel free to email or message me. *Jewelry in pic not included. I'm a blessed mommy to two of the most precious, ornery kids you will ever meet, and the wife of one of the sweetest men you'll ever meet! I love God above all and He has given me a love of all things old and ugly and the talent to turn them into beautiful and funky pieces of art. I will post things here that I do for my own home and also things that will be for sale. Hope you enjoy!